If Romain Cabon is a international circus rising star, we can now say that he has reached the summets of perfection. Indeed, a good number of artistes have chosen to work with aerial fabrics. Romain has been able to give to this new disciplin in the arts of circus a completely different style by his natural ease which gives to his movements a fluidity which could very well justify Jean Cocteau’s words: I would like to have a soul as perfect as the acrobats body; Romain can be proud to have both soul and body perfect! It would therefore be pointless to describe the feelings you get when watching such a performance as it illuminates the ring to become a real chef d’oeuvre. 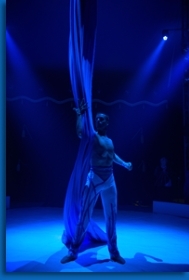 It will be while he was performing with the Cirque d’hiver in Paris during the world festival for ‘ to morrows circus’ that Romain was given the ‘Coup de coeur’ prize by the jury ! real ovation from the world of circus, which will be followed by another ‘Coup de coeur’, the one in Belgium during the european festival of circus in Liège. On several occasions, Romain has performed on the prestigious stage of the famous ‘Lido de Paris’ cabaret . His work was again recognized during the 15th international circus festival in Massy where he received the highest prize, the first ‘piste de cristal’. Romain has obtained the 2007 circus award for the best aerial performance of the year in England. No need to say that Romain is surfing on the footsteps of the greatest circus artistes able to make us vibrate each time he performs. Romain Cabon, you are one of the best ambassadors of this unwinding entertainement which is the circus, a noble art, and you can now aspire to this nobility. Have a good trip Romain, as you now have the high task to excel in the eyes opera and to keep us dream with our eyes open!